...well, the votes are in and all three of you voted for a little seam treatment series, so that's what I'll do. For those of you who don't care about seam treatments, serves you right for not voting...hee hee! This one can be worked either using waste canvas or 'by eye', depending on which you're most comfortable doing. 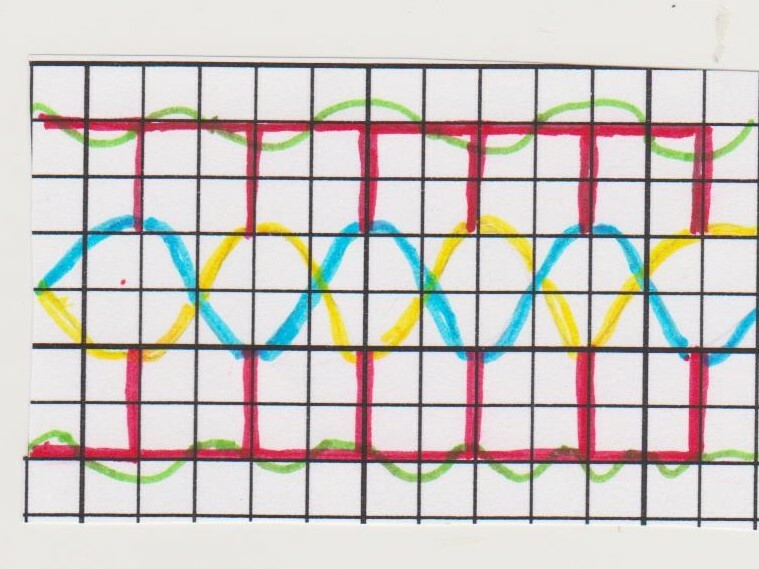 I began by doing two rows of buttonhole stitch (red in the diagram)...then I 'whipped' the base line of the buttonhole stitch with some gold (green in the diagram). 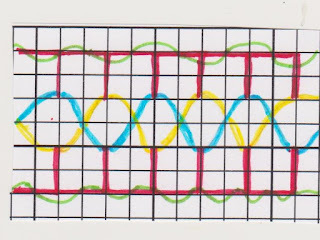 For the center part I wove silver and gold through the buttonhole stitches (blue & yellow in the diagram). It's an easy one to do, but looks like braid when it's finished. Hopefully this little diagram will help make it clearer for you. - Pam Kellogg has released another one of her amazing cross stitch patterns. This one is called 'Aria For Christmas' and features a beautiful cardinal and a music note. Go HERE for further info. 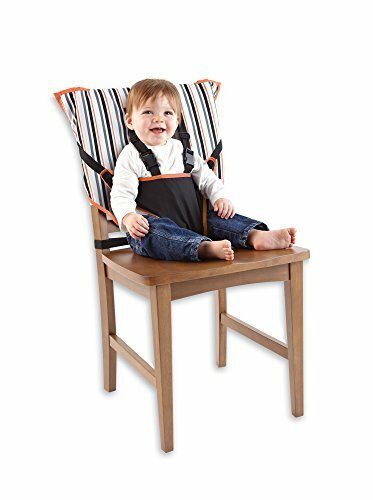 This one is on my list to make, that's for sure! Right now we're all waiting to see what's going to happen - there's a postal strike looming over us and it appears it could well start this weekend. Hopefully cooler heads will prevail and they can negotiate their way to a settlement with no interruption in mail delivery. Fingers are crossed, but it doesn't sound too hopeful for a settlement anytime soon. Today your quote is from Ralph Waldo Emerson (someone I would have loved to meet!)... "Never lose an opportunity of seeing anything beautiful, for beauty is God's handwriting"
And now - for something the same, but different...sort of. - the International Freeform Fiberarts Guild has an incredible exhibition entitled 'Flora and Fauna' and you can see it HERE. Be sure to scroll down to 'The Artists' and click on each name to see the amazing pieces they have created. Thanks to Cyra for the heads up on this one. - and for something else that is equally as amazing check THIS out! You can also see a video about it HERE. - and for a third amazing piece of art have a look at what Shirlee Fassell has done HERE. This is a seam treatment I used on the 'secret' project I'm working on. I thought I would break it down for you so you can see how I did it. First I worked a row of cross stitches which I topped (and bottomed) with rows of back stitch - both worked in embroidery floss. I finished that off with two rows of fly stitches worked in metallic thread. Hopefully this little diagram will help you to see what I did. Now, the question arises - would you like me to continue with this and do a little series of seam treatments with the instructions to make them? Or are you beyond bored with my embroidery? Stand up and vote and we'll see what happens! A bird-shaped ice cube in Jack's iced tea! Finally, your quote for today is from Rumi... "Yesterday I was clever, so I wanted to change the world. Today I am wise, so I am changing myself"
Today I have the reveal of the 'mystery project' I was working on (and before you go and get all excited about it, I'd better warn you that it's not half as exciting as you might have been led to believe). All I can say is into each life a little disappointment must fall! - There's an interesting tutorial HERE for making needle lace skeleton leaves. - and did you know that you can use gelatin for a fabric stabilizer? I didn't either - and you can read about it HERE. - This morning Connie Eyberg posted a link to an amazing video how to on making a gorgeous flower. I want to try this!!! Thanks Connie! - I'm happy to pass along the news that there will indeed be a 'Where Bloggers Create 2016' party this year, hosted by Karen Valentine of 'My Desert Cottage'. You can go HERE to find out more. I took part in this a couple of times and it's great fun....and even if you don't choose to take part, just visiting all the bloggers is bound to keep you enthralled for quite awhile. July 15th is the date. EDITED TO ADD: My apologies to Vicki Boster who I erroneously said was hosting this one and to Karen Valentine for overlooking that it was, indeed, her. So sorry! - For those of you who enjoy cross stitch and also happen to have a pirate lover in your circles, there's a nice free pattern HERE. (be sure to scroll down). - There's a great article and tutorial HERE for antiquing embroidery floss. - And for those of you who are 'Finding Dory' fans (and it appears as though there are going to be multitudes that are!) how about the crochet pattern links found HERE. The pattern I used was a free download from 'Canadian Living' magazine, but it appears they have since removed it from their files. We had one of these when our boys were small and used it a lot, so hopefully it will come in handy once again. Today your quote is from Winnie The Pooh - "Sometimes the littlest things take up the most room in your heart"
Today I actually did some sewing and made something that I can't show you - yet. Perhaps I will be able to next week sometime...hopefully. Or maybe not hopefully - depending on your viewpoint when you actually see it! 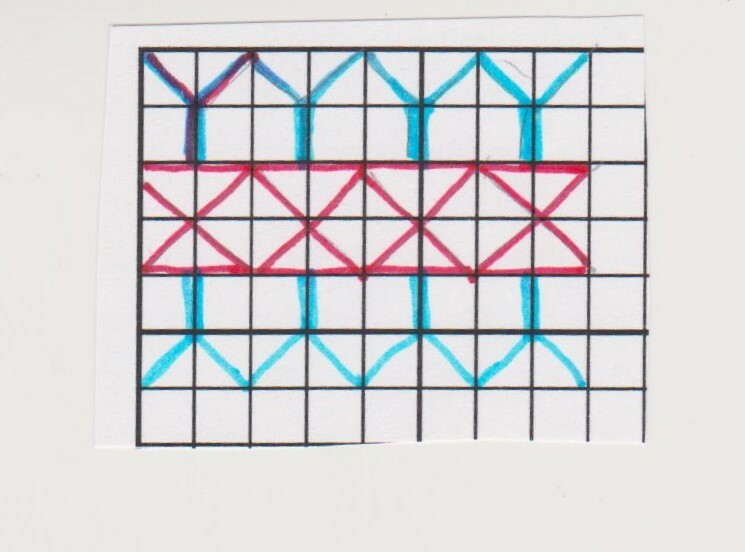 I haven't had to create a pattern with the drawn-out grid method for a very long time. I remember now why it's a complete and total pain - literally. Today your quote is from Ellen DeGeneres.... "We focus so much on our differences, and that is creating, I think, a lot of chaos and negativity and bullying in the world. I think if everybody focused on what we all have in common - which is - we all want to be happy"
Here's the last in the series of crazy quilt postcards - number nineteen. That's not to say there won't be more at some point, but for the moment I'm postcarded out and need to switch gears and work on something else for awhile. Sorry the colour is a bit 'off' on this one - it actually has a white background. Today your quote is from Rachel Carson... "Those who contemplate the beauty of the earth find reserves of strength that will endure as long as life lasts. There is something infinitely healing in the repeated refrains of nature - the assurance that dawn comes after night, and spring after winter"
As of this moment, they are all complete - stitched and sewn up ready for mailing. I have one more to show you, but I'm going to make you wait until tomorrow for that. My next crazy quilting project has to be a secret one because it's for the magazine and you'll just have to wait until the winter issue to see what I do - if, of course, it turns out!! Your quote for today is from Neil Gaiman....."Whatever it takes to finish things, finish. 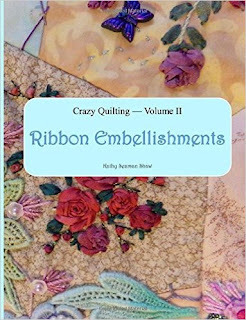 You will learn more from a glorious failure than you ever will from something you never finished"
The new calendar has some beautiful art done by thirteen amazing crazy quilt artists who entered the contest. The judges (myself included) had a really tough time in choosing the winners. You can see a peek of the winning work by cover artist Connie Eyberg above. 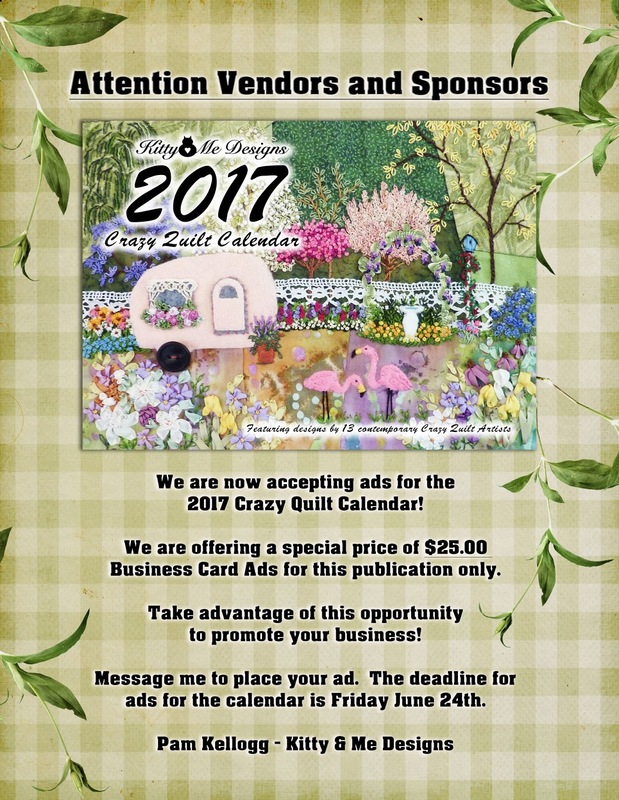 So, if you would like to place an ad in the 2017 calendar, please contact Pam at pkellogg AT mc DOT net or you can drop a note to me as well and I will pass it along to her. You do know to replace AT with @ and DOT with a . I'm sure! 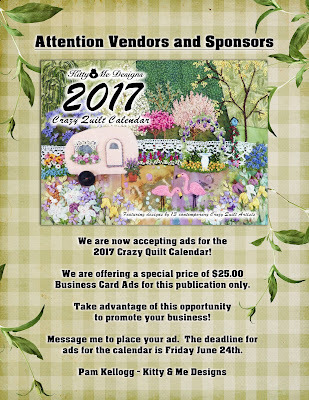 - AND - Pam has just released a list of the winners of the crazy quilt calendar contest HERE!!!! Of course you can't see the winning entries just yet - you'll just have to purchase a copy of the calendar when it's available for that. I'll be sure to let you know as soon as you can get a copy. It's slated for release on Sept. 1st. - Just a wee note to say that I have finished all nineteen postcards in my series and now it's on to the finishing touches. Will post pictures later this week of the last two in the series. Today your quote is from Napoleon Hill... "Patience, persistence and perspiration make an unbeatable combination for success"
Over the weekend I completed #17 of the postcard series. It's turned hot here over the past couple of days and today is supposed to be a scorcher. I really don't mind the heat, but I must admit that today might just be a little much. If the humidity level would stay down it would be so much better! Today your quote is from James Dent... "A perfect summer day is when the sun is shining, the breeze is blowing, the birds are singing, and the lawn mower is broken"
Today your quote is from Bill Watterson.... "Weekends don't count unless you spend them doing something completely pointless"
and be sure you love every minute of it! My copy of Kathy Shaw's latest crazy quilting book arrived in the mail yesterday and I must say she's outdone herself with this one. Of course I have had a sneak peek at it all prior to publication (being a proofreader does have its perks!! ), but it's a thrill to see it all together and looking so grand. This is volume II of what is planned to be a series of four. (Volume I - Beyond The Basics; Volume II - Ribbon Embellishments; Volume III - Magnificent Motifs; and Volume IV - Beyond the Expected). You can purchase your copy via Amazon. Pam Kellogg also has a new publication - she has re-released her 'Hearts & Flowers Biscornus' pattern ( so pretty!!) and you can get more information on that by going HERE. And, a little birdie has shared with me that there will be another crazy quilt calendar contest coming up - I'll let you know more about that when the details are finalized. "Fabricologist Resource Centre" - that sounds more impressive than "fabric stash"
Well, it's obvious I did that very thing! Because the postcard I posted yesterday was really # 14 and it appears I can't count!! Oops! So.....this one is number 14 then, or it can be 15....or whatever you want it to be, because obviously I haven't a clue!! (All I know is that there are four more to go and I can count those on one hand...phew). Today your quote is from Arundhati Roy... "To love. To be loved. To never forget your own insignificance. To never get used to the unspeakable violence and the vulgar disparity of life around you. To seek joy in the saddest places. To pursue beauty to its lair. To never simplify what is complicated or complicate what is simple. To respect strength, never power. Above all, to watch. To try and understand. To never look away. And never, never to forget"
Despite taking a ton of pictures, this is the only one that shows the costume - I either got a picture of the costume and a blur that was our grandson, or I got him and the costume was a blur. My picture taking abilities obviously are sadly lacking. Mind you - having a whirling dervish grandson certainly doesn't help matters! Two year olds are busy!!! There's just a wee mumble for you today (but it's a goodie!). Go HERE (and be sure to scroll all the way down!!) to see what I'm raving about. Lastly, my heart and prayers go out to the people in Orlando - a tragedy beyond compare. There have been a couple of queries about what I plan to do with these pieces so here's the scoop - they will be stiffened with some heavy interfacing and backed with fabric that has been rubber stamped with the words 'Post Card'. Once done, they will be sent through the mail (inside an envelope for protection) as little gifts. Hope that clarifies my plans! Today your quote is from the infamous anonymous.... "A careless word may kindle strife. A cruel word may wreck a life. A timely word may level stress. But a loving word may heal and bless"
...that the regularly scheduled programming on this blog just HAS to involve some mumblings. Right? Alas, there hasn't been enough stitching of any significance to post any pictures, so instead I shall mumble once again. I know - poor you! - Vicki Welsh has a fun (free) quilt pattern you can check out HERE (the link to the pattern is in the first paragraph). Great use for scraps, batiks or even an Eye-Spy! - There's what sounds like a hugely fun "Santa Sack Swap' open for registrations HERE. I'm toying with signing up for this one - but with the grandbaby coming I'm not sure I will have enough time to do it justice. 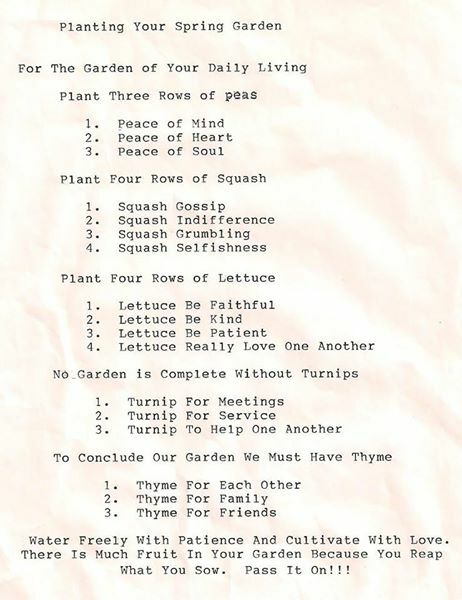 (Found via 'Wisdom With Needle and Thread' - thank you). - This is just a reminder that Sharron Boggon has an ongoing weekly embroidery stitch on her blog (called 'Take a Stitch Tuesday'). She gives excellent instructions for each stitch, as well as some ideas of how you can use it. Go HERE to see what she has this week. If you've missed the previous weeks I'm sure you can scroll back through her blog and see them. - For those who live in the US and enjoy cross stitching, perhaps you'd like this free Fourth of July pattern HERE (the heart can be used in other applications too). - This one falls under the 'awww' category. For crocheters who happen to like hearts - have a look HERE. 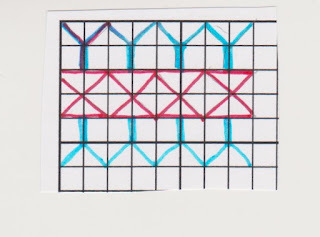 I can see this used in crazy quilt applications too! - Another one for the 'awww' category. Go HERE for a sweet little owl coin purse. - THIS would be great for the guys in your life (but I suspect, with a simple change of fabric, the gals would be happy too). - Just a reminder about the amazing charitable opportunity that Vicki Boster is spearheading this year. Go HERE and please consider getting involved! - If any of you are involved in selling your work at any craft sales over the next while, perhaps you might find the great tips HERE to be helpful towards improving your sales. Today there was some stitching - a big difference from the past couple of days which were spent doing things that weren't the least bit productive (but my shelves are looking a whole lot neater). Today I came across this quote about gratitude and thought it was very fitting right now. The author is unknown. "Gratitude is the music of the heart, when its chords are swept by the breeze of kindness"
Believe me my friends - our family has felt your breeze and can't thank you enough. Bless you all. I know this blog has gone off the normal mumblings, but today I want to extend my personal thanks, as well as those of Winnie and Shawn, to all of you that have us in your thoughts and prayers. They mean more than you can ever know. When we come together to hope and pray for a common good, we bloggers are a powerful force. The latest update is this: Last night Winnie was taken by ambulance to another hospital which has a very up-to-date neo-natal unit and a team of specialists. The decision by those doctors was to operate to insert a drainage tube into her gallbladder which will need to remain in place until the baby is born. The surgery was successful but the trauma started contractions. The doctors were hopeful that they would stop on their own and at about 2 am they did. Winnie has been in pain since Friday and Shawn has had virtually no sleep in all that time. As of a few minutes ago he was heading home to grab a few hours sleep before heading back to the hospital. The next step is for her to try to eat something (she hasn't had anything since Friday, other than fluids through the IV) and if that doesn't trigger any undue pain, she might be able to go home tomorrow. Once again, thank you all for your concern and for caring about my kids. Bless you all!! Most of you know that our #2 son and daughter-in-love are expecting a baby in September and that the wee one is definitely a miracle after they tried to have a baby for so long. Right now our daughter-in-love is facing imminent surgery to remove extremely painful gallstones which the doctors have decided have to come out. She's been on morphine for the pain, which is also risky for the baby. I know not all of you are believers and I normally don't say too much about my beliefs, but in this case I am. If you pray, please consider adding Winnie and Shawn to your prayers and if you don't, please hope for the best.